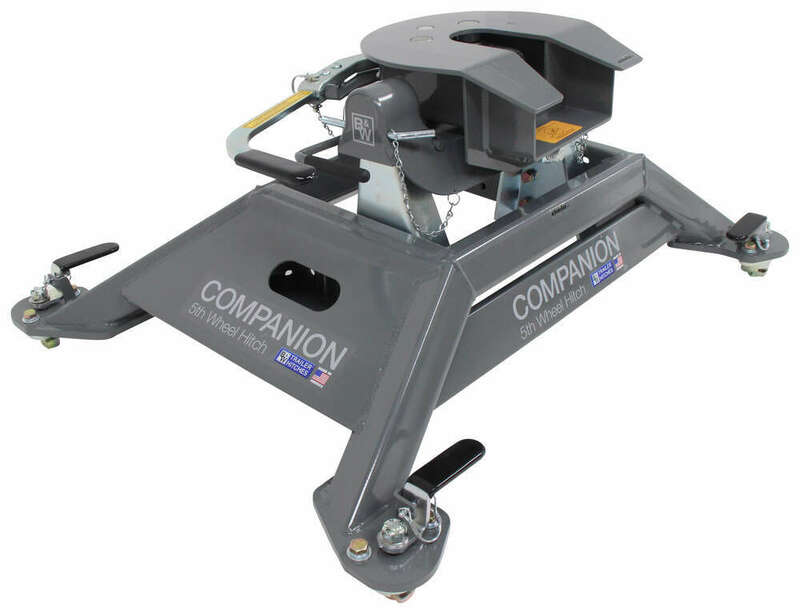 Specially designed to attach to the receivers in your factory 5th-wheel towing prep package, the Companion OEM features a dual jaw for excellent jaw-to-king-pin contact and a cam-action handle for simple release. Easily remove for full bed access. 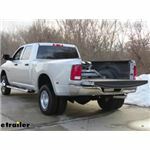 Call 800-298-8924 to order B and W fifth wheel part number BWRVK3600 or order online at etrailer.com. Free expert support on all B and W products. 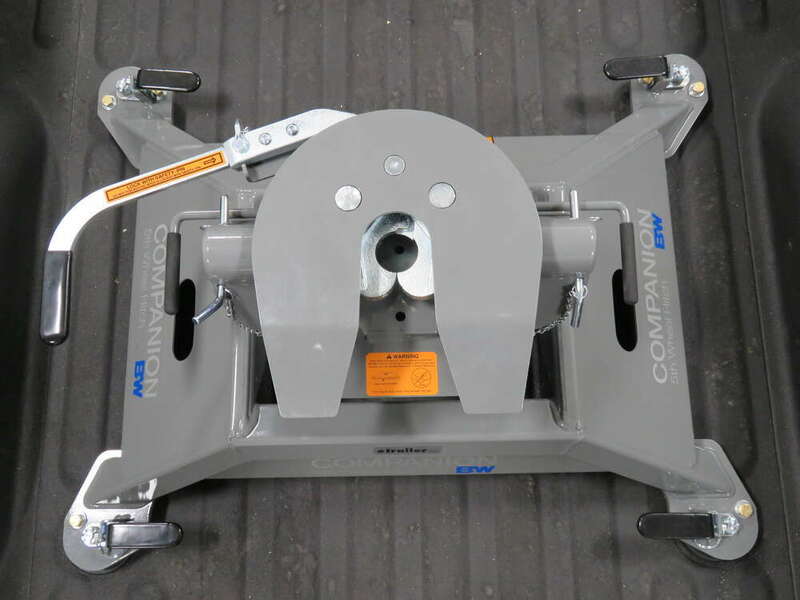 Guaranteed Lowest Price and Fastest Shipping for B&W Companion OEM 5th Wheel Hitch for Ram Towing Prep Package - Dual Jaw - 25,000 lbs. 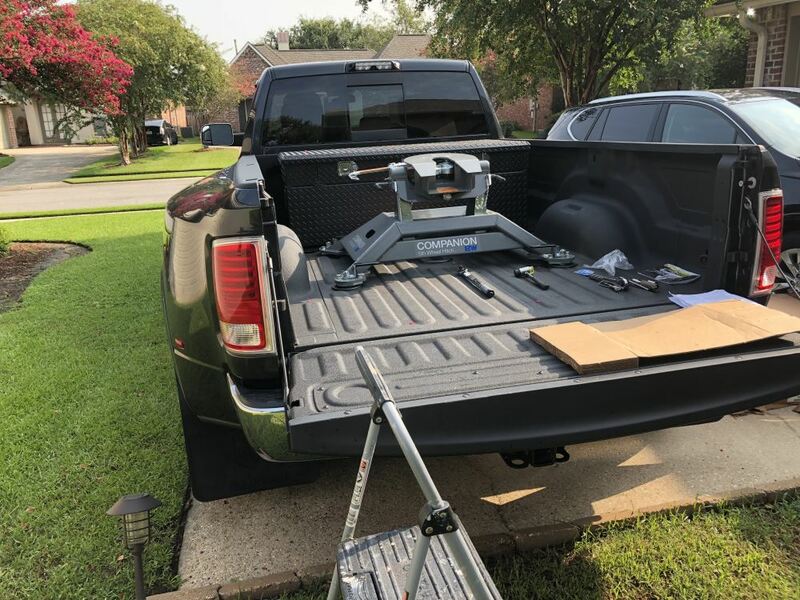 Fifth Wheel reviews from real customers. 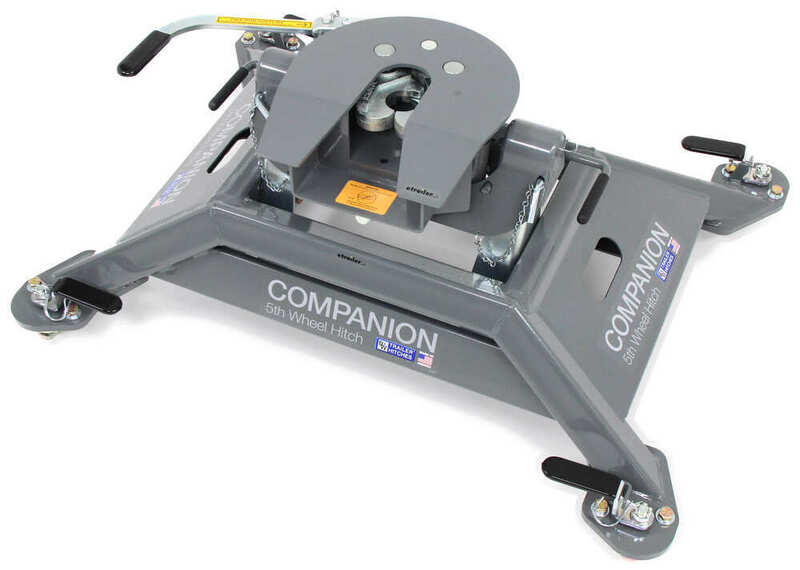 Specially designed to attach to the receivers in your factory 5th-wheel towing prep package, the Companion OEM features a dual jaw for excellent jaw-to-king-pin contact and a cam-action handle for simple release. Easily remove for full bed access. 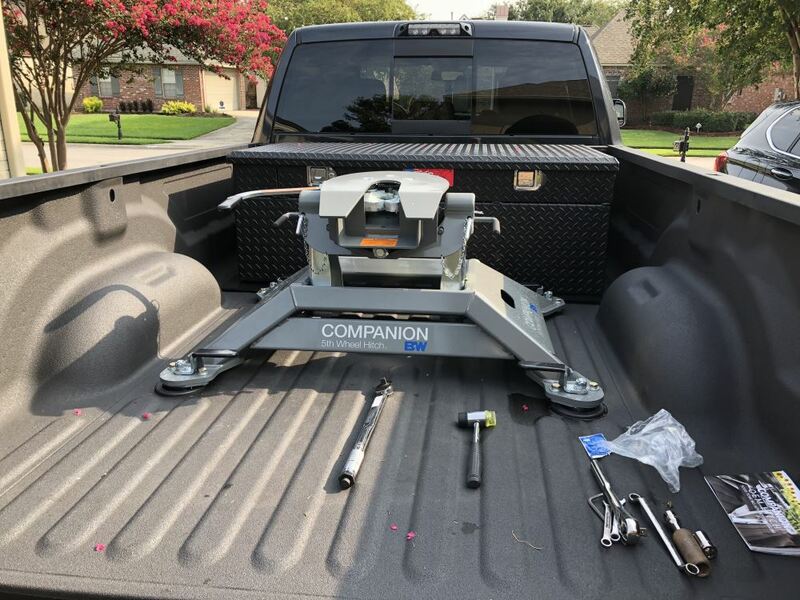 Hitch height: 17" - 19"
The 1" thick jaw on the Companion OEM is precision machined to provide a tight, sturdy connection. 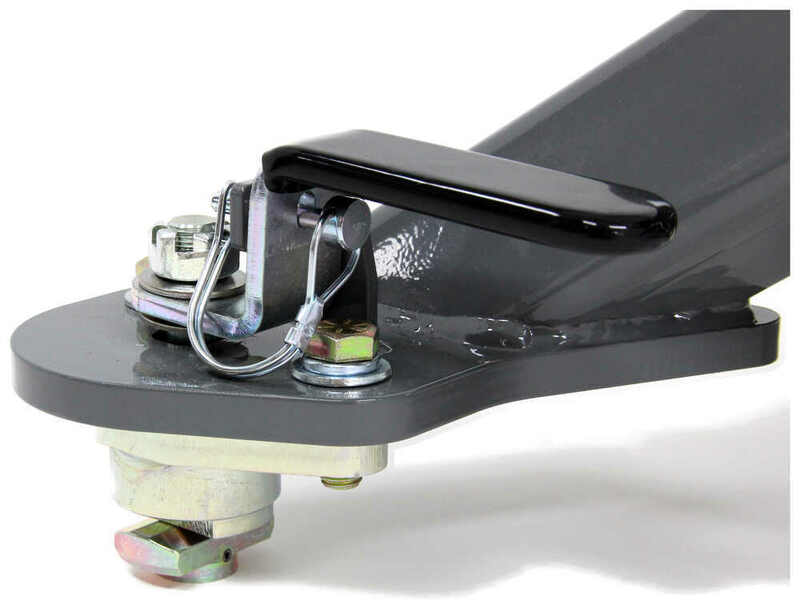 And unlike slide-bar models, the rounded 2-piece jaw on this fifth-wheel trailer hitch inhibits rattle and movement by securely wrapping around your trailer's king pin, resulting in easier hookup and a safer, quieter ride. 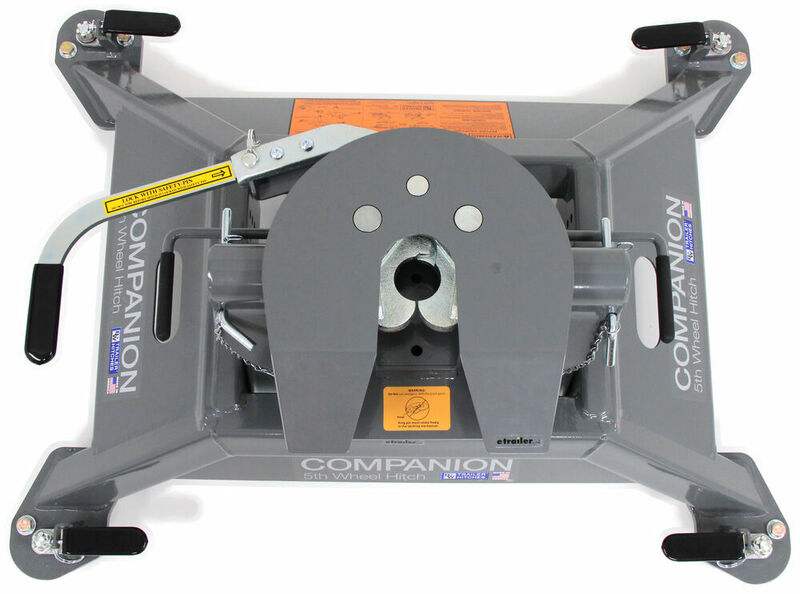 The dual jaw on the Companion OEM is operated by a simple-to-use cam-action handle. 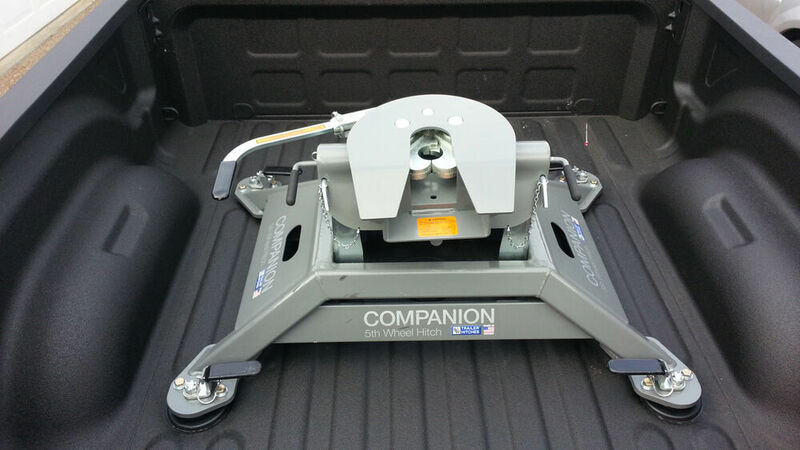 This handle allows you to quickly and easily release the jaws on the hitch, even if you are on uneven terrain. 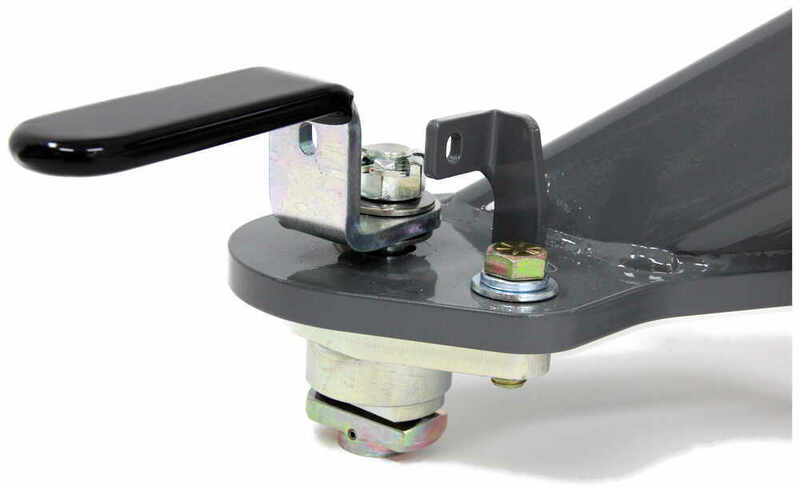 If any binding does occur between your truck and trailer, the jaws may remain closed after you move the handle to the open position. 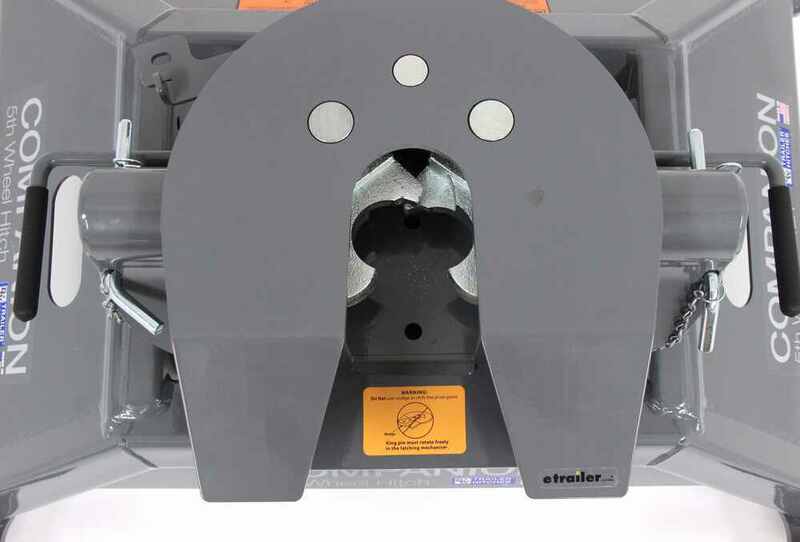 But because the handle is unlatched, there is nothing keeping the jaws closed except for the binding pressure. 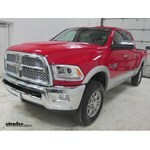 Therefore, simply driving your truck forward will be enough to force the jaws to open. The cam-action handle is held in the closed position with the included pin and clip. For extra security, you can replace the pin with a sturdy padlock. The shackle on the lock you choose should have a diameter of 5/16", height of 3", and a width of 2-1/4". To install the Companion OEM, first set up the Companion's pivot arms. 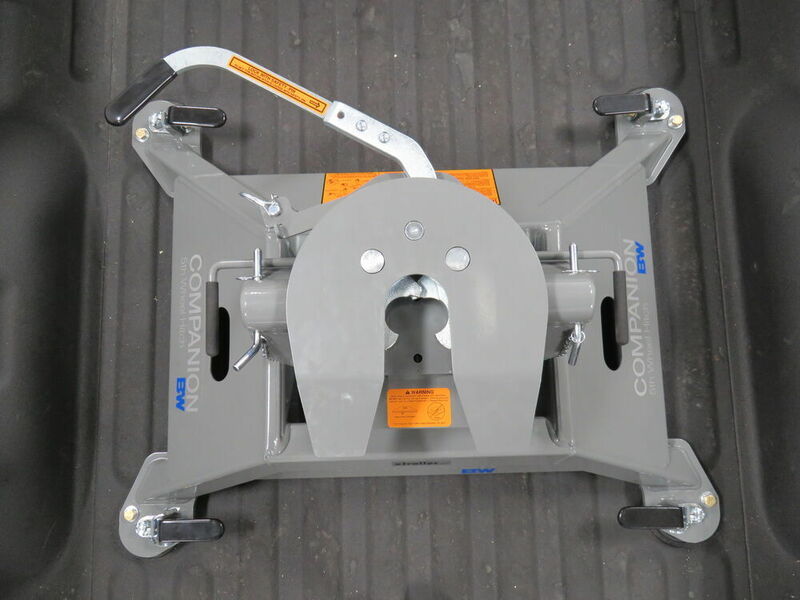 The arms are what allow the hitch to be adjusted front to back as well as up and down for optimal positioning. 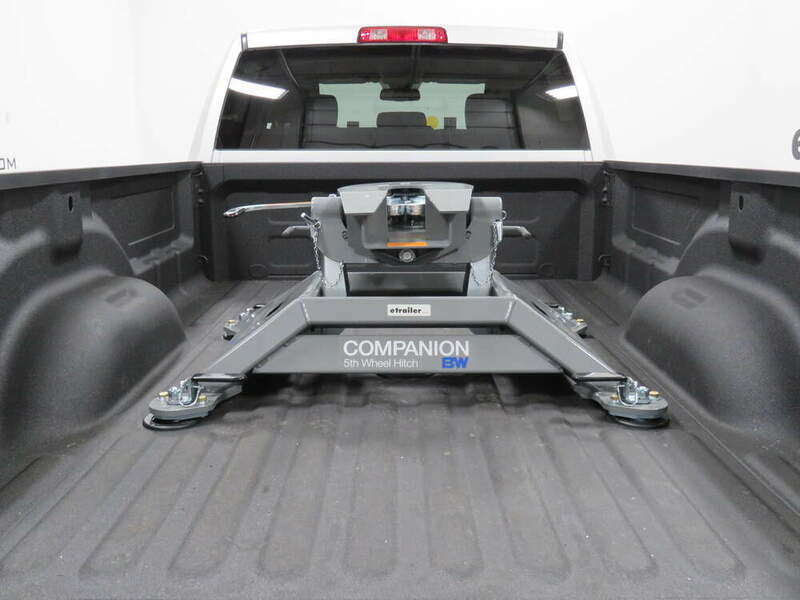 As a result, this hitch can accommodate the height of your trailer and also help to give you the cab clearance needed to execute turns while towing. 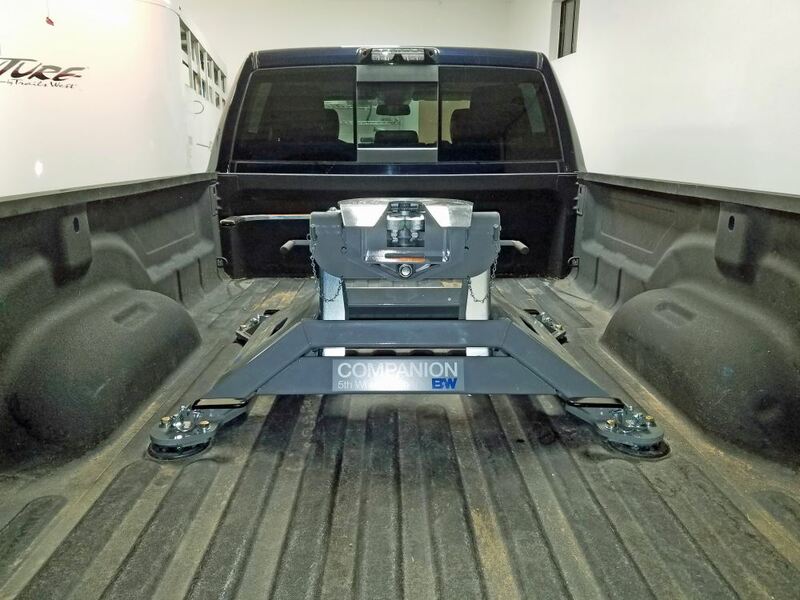 To adjust either the height of the hitch or the fore/aft positioning, just attach the hitch's pivot arms in the desired location on the base. 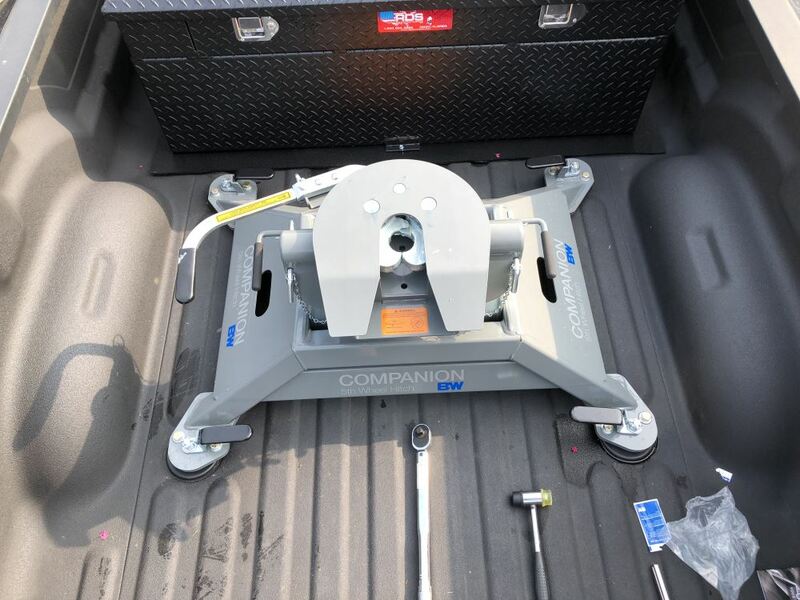 Then, when the hitch head is fully assembled, simply place the hitch in the bed of your truck, lining the base up with the receiver sockets in the bed. 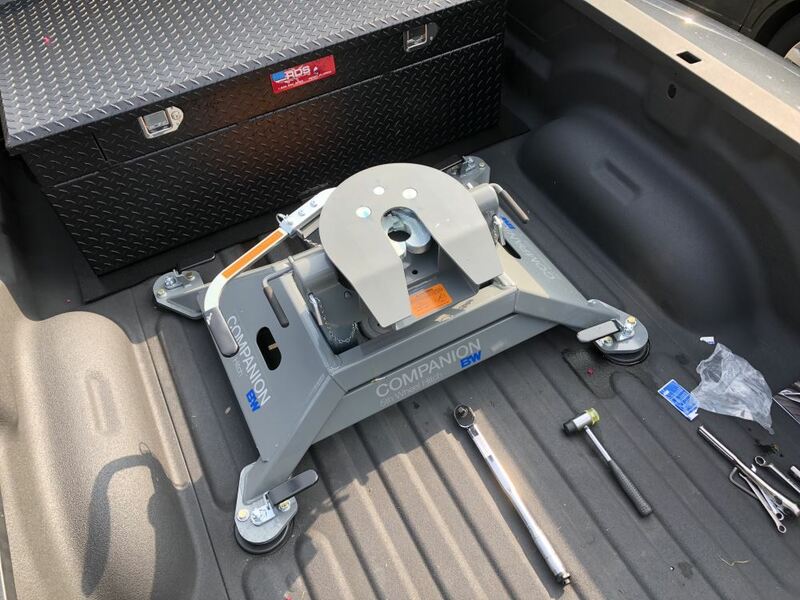 Rotate all 4 handles on the hitch base out so that the built-in puck receivers are in the correct position to install in the sockets. Once the base is lined up, fold the handles in until they are in the locked position and secure them with the included pins. The hitch head installs on top of the pivot arms. When you have the head in position, simply secure it to the arms with the included pins. Today we're going to review Part number BWRVK3600. 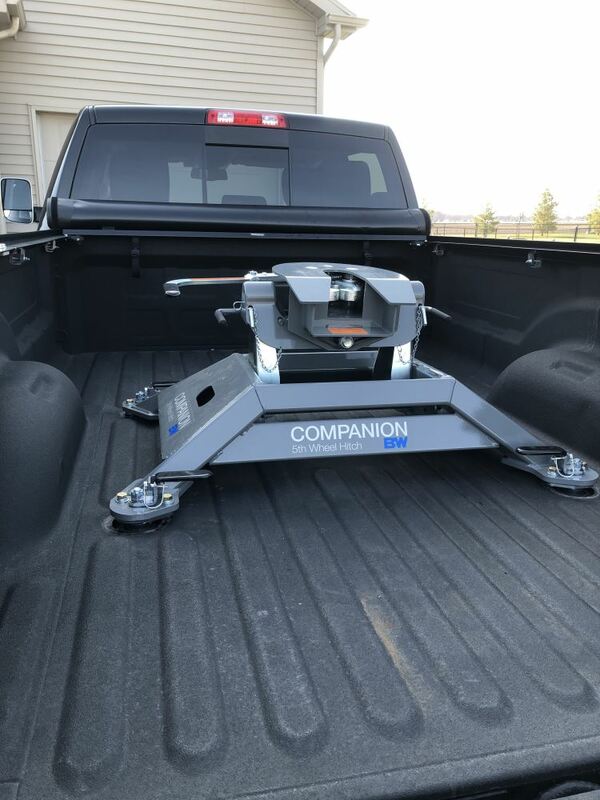 This is the B&W Companion Dual Jaw 5th Wheel Hitch for the factory Ram towing prep package and has a 25,000 pound weight capacity. Now, this is a custom fit application. 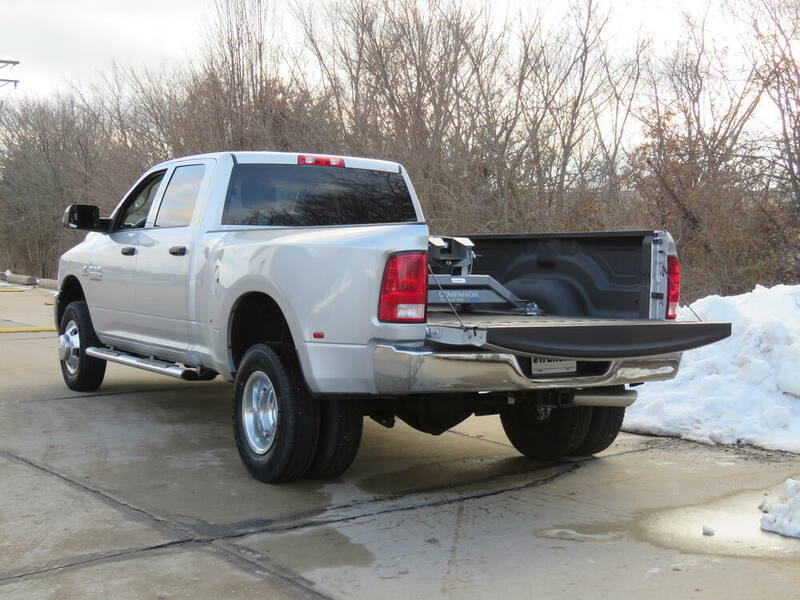 It is designed to fit on the newer Ram trucks with the factory installed towing prep package starting in 2013. 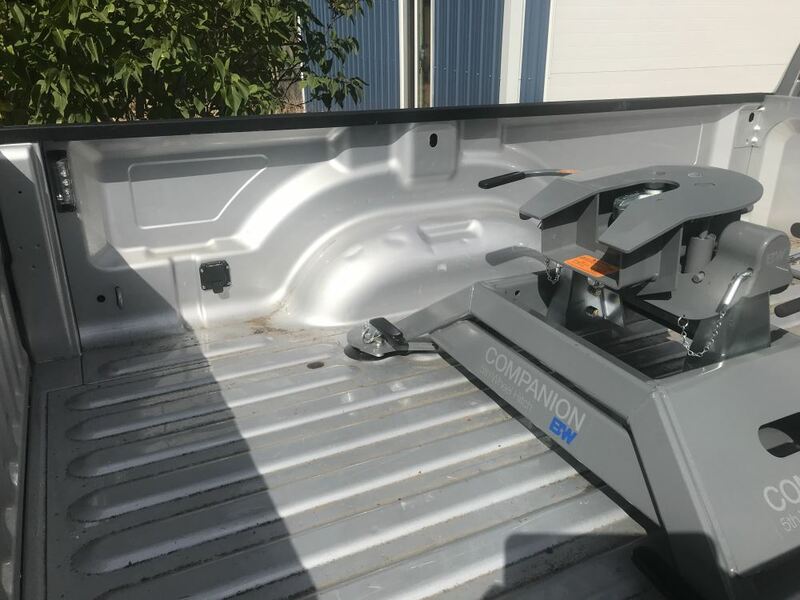 This 5th wheel hitch will mount in your truck bed so that you can tow a 5th wheel trailer. It's a very quick and simple installation. Basically, these tabs, one on each corner, will drop into the 4 receiver pucks that are built into your factory under bed rails. Then with the handles, will lock into place and you're ready to tow a 5th wheel. Basically, the way you would do that, right now the handles are pinned and locked into the lock position. To open it up, you pull the clip and the pin out, rotate that handle 90 degrees. That tab will rotate 90 degrees and that'll allow you to lift this out of your bed. 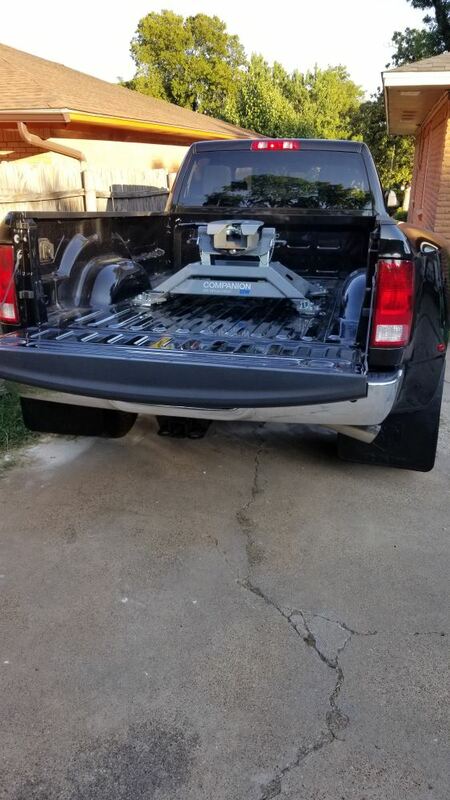 When you're not towing, you have full access to the truck bed. When you go to install it, you'll leave it in the open position, all 4 of them, drop it into the pucks in the under bed system, rotate it 90 degrees. That tab will rotate and lock into that factory system. Take your pin, slide it back through, put the clip on, and it locks the handle for moving. You do that to all 4 and it's ready to go. Very quick installation to install it or remove it. 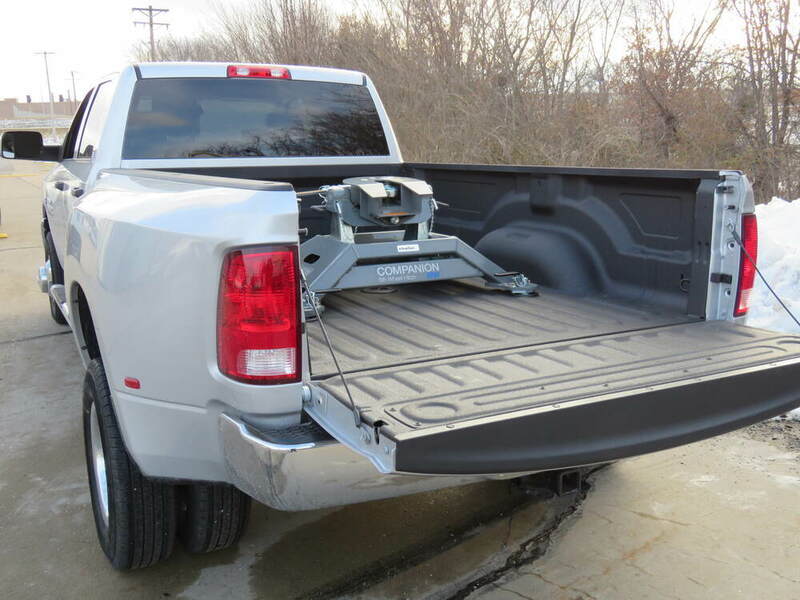 Again, because it's a rail free design, there's no rails in the truck bed. It'll still, once you're not using, gives you the full access when the hitch is removed. 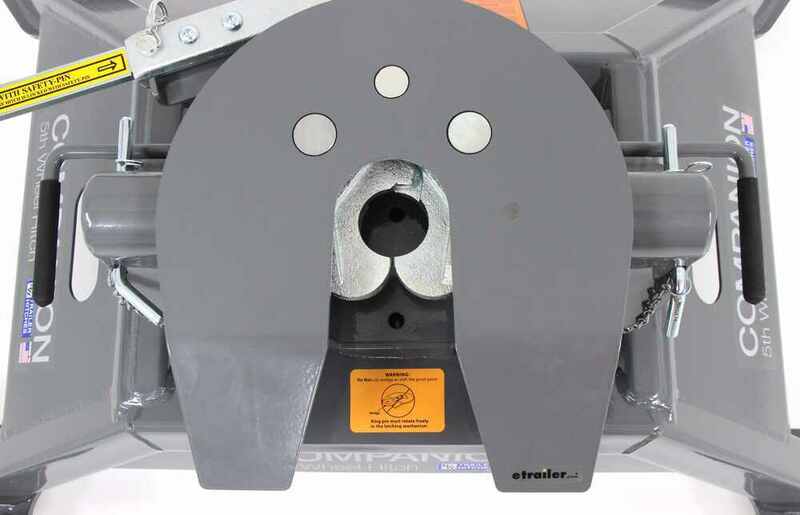 This hitch you can see here has the one inch thick dual jaws. That'll provide a 360 degree jaw to kingpin contact. That'll give you less rattle and more security than the slide bar jaw designs. It has this cam action latching handle, which will help prevent binding. It's very simple to release even on unlevel terrain. It comes with the pinning clip, but you can actually purchase a padlock separately. You could lock it to secure the trailer to the hitch. To show you how the handle and the jaws operate, pull the pin and clip out. You take your handle and rotate it towards the cab or to the forward of the tow vehicle. You can notice the dual jaws will open, ready for the kingpin to go in. Once you back up and the kingpin slides in here, it would push on the back of these jaws, which would push and then move that handle back into position and wrap the jaws around your kingpin. With the handle not going any further, take your lock or your pinning clip, drop it into the hole, clip it, and then that keeps the handle from moving and then you're locked around your kingpin. It does have this fully articulating head, which will ease hookup and helps limit chucking. It's front to back. The plate itself will move side to side. It gives you a nice fully articulating head. You can get improved cab clearance for your application. These pivot arms that are bolted to these legs right here, this base part, there's a multitude of holes drilled into this base. You can move these pivot arms in 4 different horizontal front to back adjustments to get the correct clearance for your application. These pivot arms can be mounted in 3 coupler height settings. There's different rows you can put it on and get 3 height settings to get your correct coupler height. It'll range from 17 to 19 inches in one inch increments. 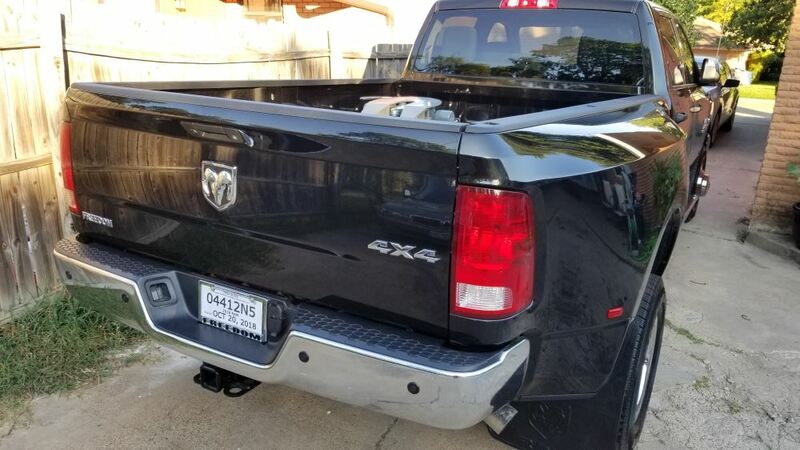 That's from your truck bed to the top of your hitch plate right here. This gives you a quiet, rattle free ride. This head is sitting on polyurethane bushings. On the top of theses pivot arms, there's 2 polyurethane bushings that this will sit on and give you a nice rattle free ride. 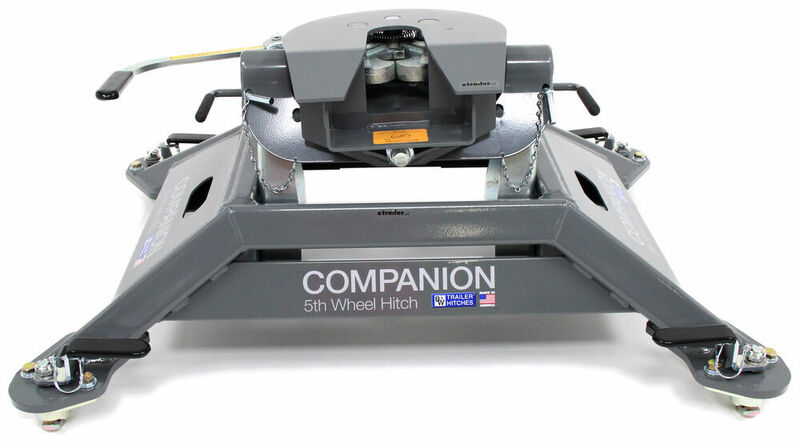 The hitch itself is constructed of steel, has a nice gray powder coat finish, which is corrosion resistant. 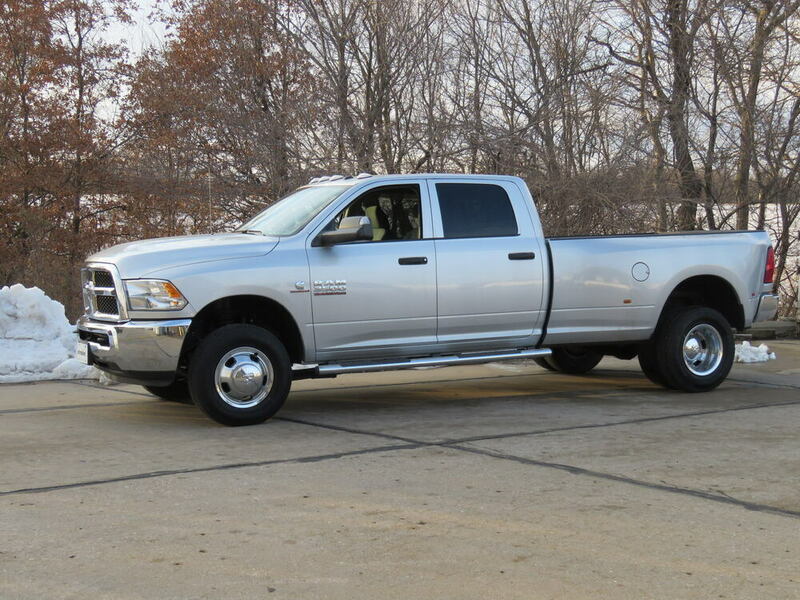 The gross towing weight capacity on this is 25,000 pounds. The vertical load limit or pin weight capacity is 6,250 pounds. 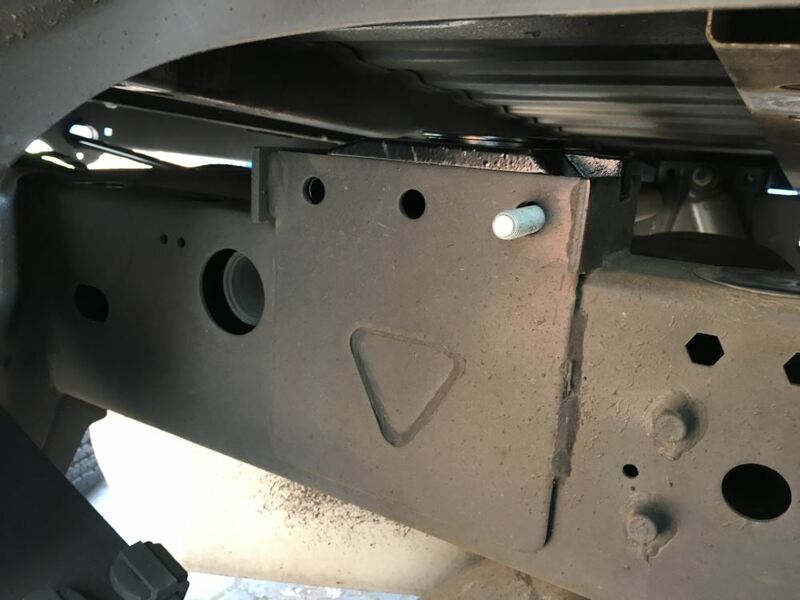 Again, the hitch height adjustment we mentioned is 17 inches to 19 inches. 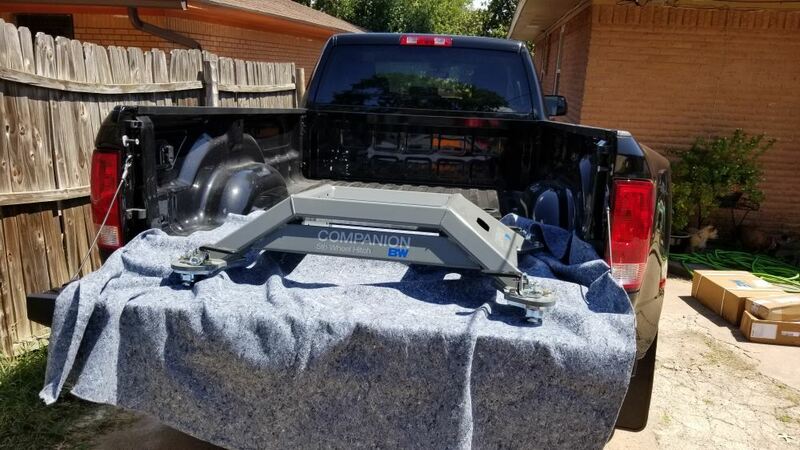 One other thing I want to show you is lots of times you might not have somebody if you want to remove this from your truck bed and you don't have anybody there to help you. 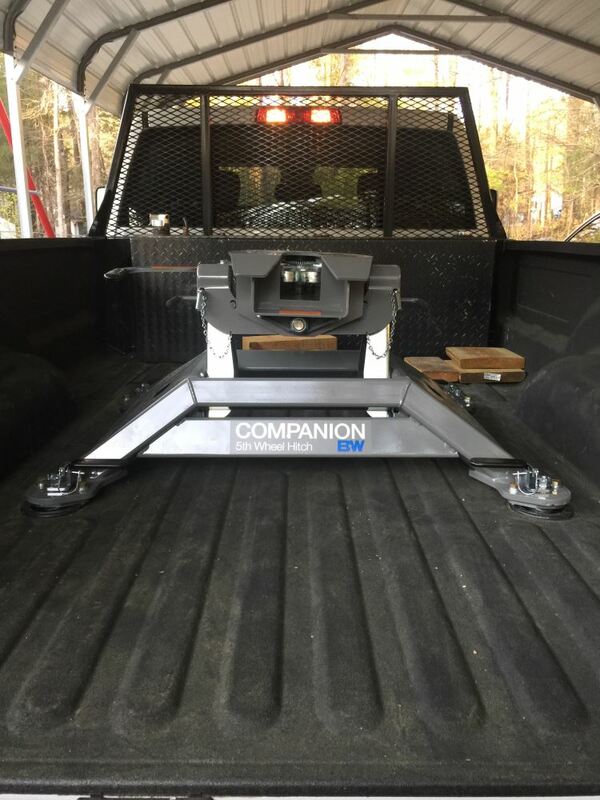 If you want to do it by yourself to make it easier, what you can do is the hitch head's made to remove pretty easy. These 2 pins and clips right here, you pull the clip out, drop the pin. The same way over here, push/pull the clip out and drop the pin. What you can do is to remove this head off the pivot arms, you see these 2 handles right here You pull on those when you lift them up. That'll release it from the pivot arms. Then you can lift the whole head off by yourself. 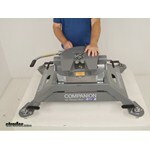 That will cut down on the some of the weight then you can take the whole base and the pivot arms off by yourself also. If there's nobody there to help you, that's a nice, simple, easy way to remove it if you're the only one there. If you put it back together, put the pins back in. Once you drop the head onto the pivot arms, put the clip back in. Same way over here. You notice the nice thing is they have them chained so you don't lose them. You take the clip, put it right back in. There we go. Clips right into place and then you're ready to go. 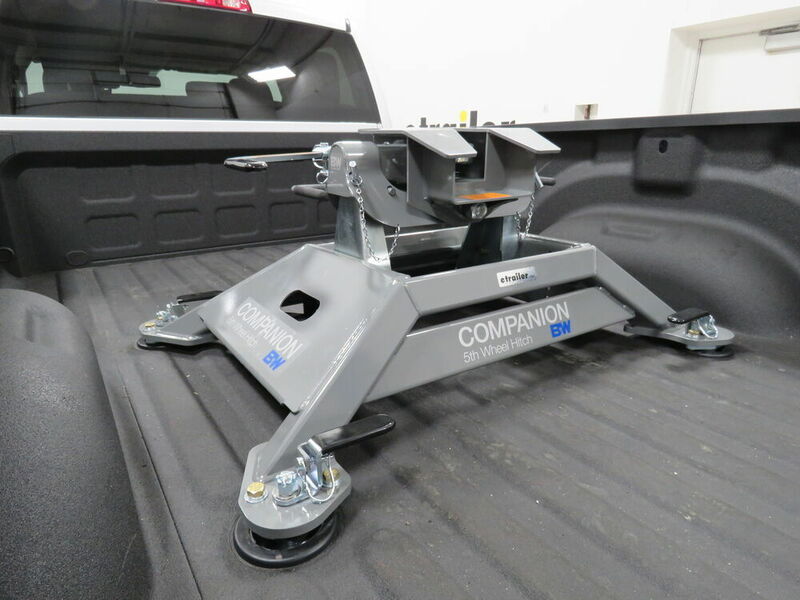 That should do it for the review on Part number BWRVK3600, the B&W Companion Dual Jaw 5th Wheel Hitch for the factory Ram towing prep package. .
Order: RelevanceNewestRating - High to LowRating - Low to High Specially designed to attach to the receivers in your factory 5th-wheel towing prep package, the Companion OEM features a dual jaw for excellent jaw-to-king-pin contact and a cam-action handle for simple release. Easily remove for full bed access. We are very impressed with the B&W hitch. My wife and I both hitch and unhitch without any problems. Ill say it again. Thanks B&W for a great hitch and thanks etrailer for a great deal. Great would recommend to anyone who wants a top notch product with durablity and lasting power. 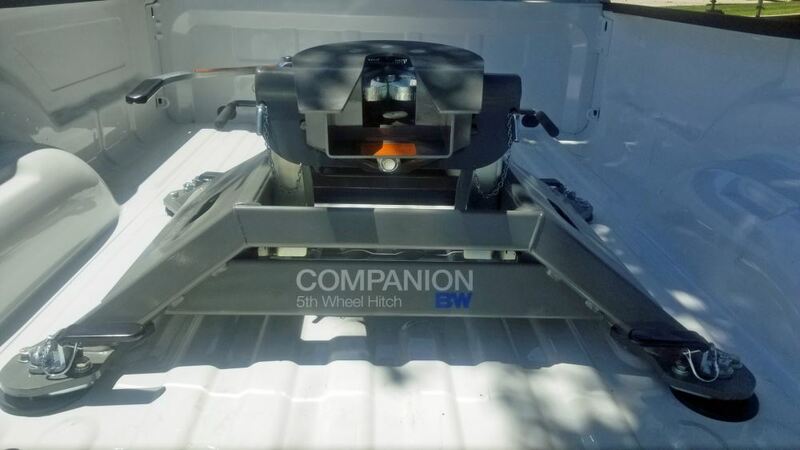 Have traveled many trips with hitch and by far the best around for all your trailering needs! 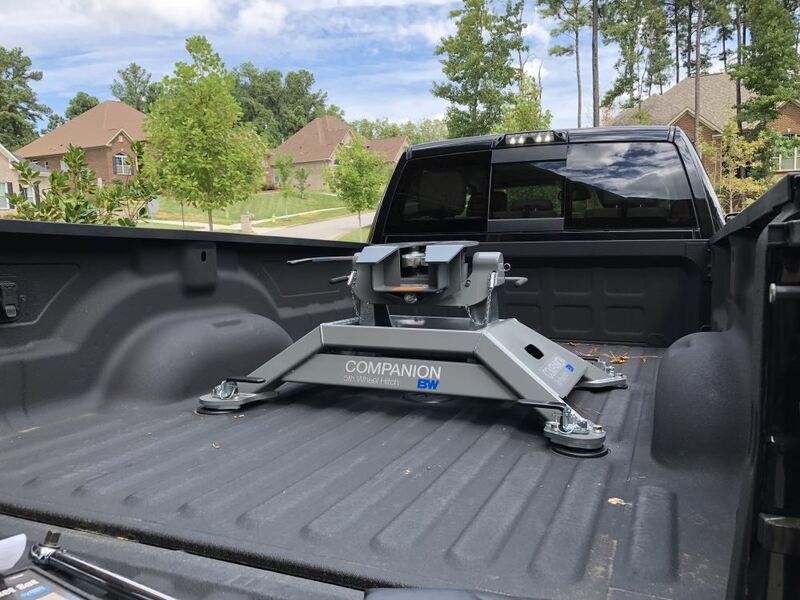 Pulled through Tallahassee, Birmingham, Memphis, Little Rock, Shreveport, Mobile and Monticello and it is a comfortable, well-built, easy to use hitch. Etrailer also gets my recommendations regularly. Working great. We have used this for one year and exceeds all my expectations. Easy to remove and install and really solid. Great purchase. Fantastic! Works as designed and keeps my rig straight down the highway lane. Great product. I have been pulling with this hitch for a year now a few thousand miles through all kinds of hard terrain and all over the Pacific Northwest. I stand 110 by my initial review. This is the best hitch I have ever used. The ease and safety of hitching and unhitching alone was worth the money not to mention the peace of mind. Smooth sailing. Best hitch I have ever used. On that issue I recommend a step you can leave in bed to pull out and step up to secure lock. Thats my plan for now. One of the folding wheel mounted steps might do the job. Thanks for the suggestion Tom, below is a link to tire steps we currently offer. buy a pair of mechanical fingers, thats what I use. One further comment. The jaws as seen from the back when closed should be painted yellow. Then it could easily be noted that they are closed. 1 year in and hitch is working very well. Still tight fitting with no signs of wear. Following the lubrication guidelines keeps the hitch working perfectly. The poor manufacturer shipping packaging container that caused so much damage to my new hitch finish is still a huge contention for me. How can such a awesome quality be packaged in such a shoddy card boards box allowing the hitch to be scratched heavily and legs poking out the side of the shipping container. It is a shame a $1100 dollar hitch was placed in a 50 cent shipping box. Terrible quality control by the manufacturer. 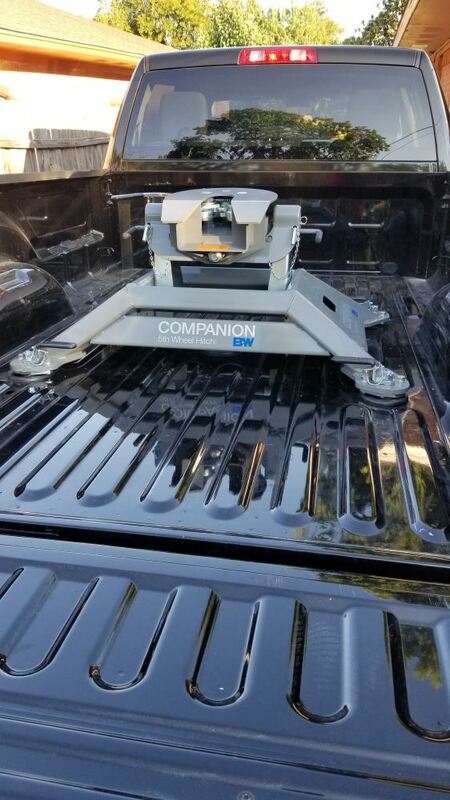 The B&W Companion OEM 5th Wheel Hitch for Ram Towing Prep Package # BWRVK3600 is compatible with the Ram Factory Rail Kit and RamBox on your 2015 Ram 2500. I've attached a photo of that application to assist. 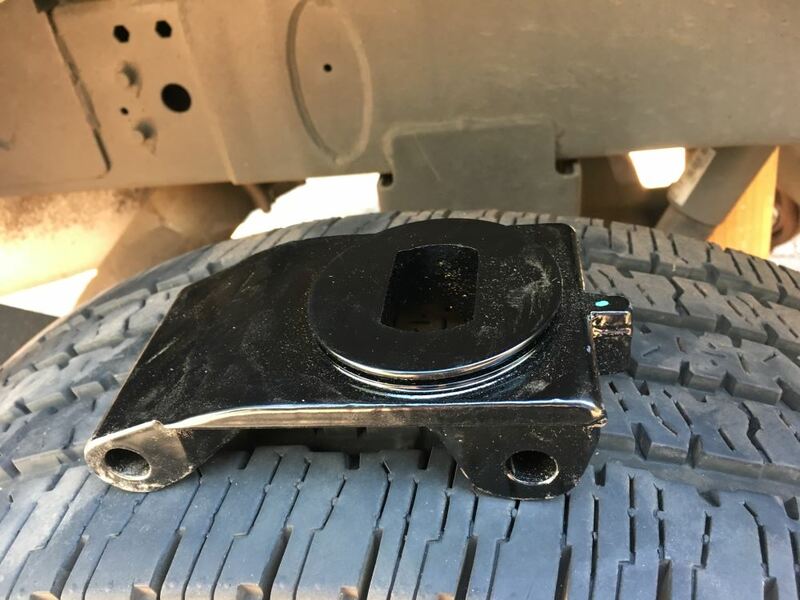 You may also want to consider the 5th wheel wiring harness # 50-97-410 to an easy connection point and clean look.